The lobby area of Willows Lodge in Woodinville, Washington, is packed with interesting architectural features and decor, so it's fun to photograph brides and grooms there. In this photo, the couple took a seat in side-by-side chairs and held hands. I photographed them from the far side of a coffee table with these balls made from natural fibers sitting on top. 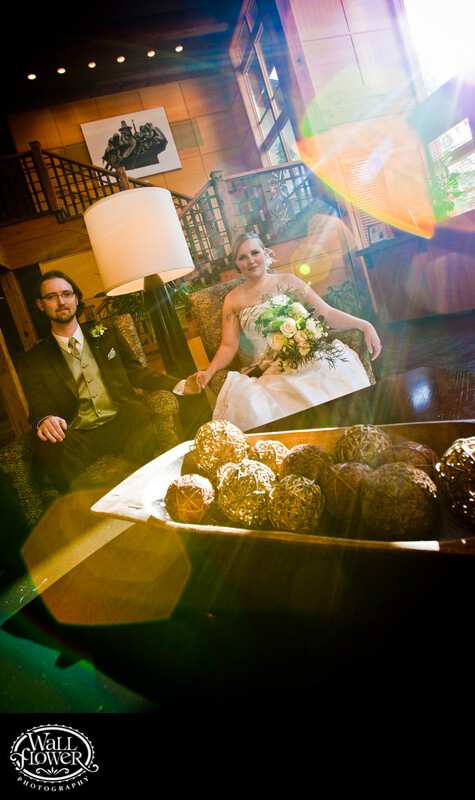 Sunlight was flooding into the room through some large windows to the right of the frame, but a little angle to the camera moved it into the corner of the photo, and lens flares burst across the photo from there to the far corner.